So pretty! 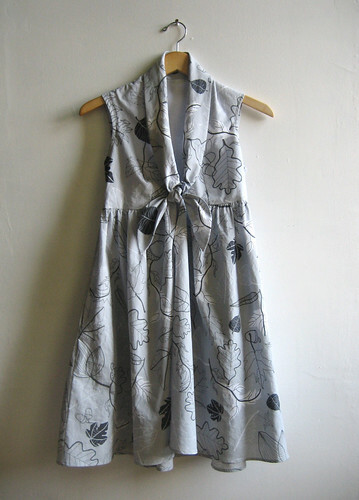 You're such a clever lady, I really want to get better at making my own clothes ( I too have a limited buying budget!). I love the red shoes, too! You rock! A few bloggers got that dress and I was like:"honey, is it normal that I think that 400$ for a dress is kinda crazy a bit??". Your dress is perfect and the fabric is super cute. And when you have a limited budget (like me! ), it makes things even better when you get a similar look for a lot less $!!! Kitten – It's a pretty easy dress to make, I definitely didn't use my patternmaking skills too heavily for this project. If you had a pattern for a basic bodice you could make one really easily by altering the neckline and adding a skirt. Becka – I am really trying to make more of my own clothes right now, especially since I have patterns and a serious addiction to stock piling fabrics. I just need to remember to take the time to sew for myself! And Claudia – I also noticed that! While I love supporting small designers, etc. that is just a heck of a lot of money for me at this moment (and probably always)!! Our wardrobes are going to be awesome once we make all these handmade clothes! It's sure great that you know how to sew!